Ji Hyo stepped out and sighed. In one cold day when rain never stop poured and swept the clover on backyard. Her lips trembling and her gaze contained great pain that she couldn’t bear any longer. Her legs were weak. She gave up her body on the wall when her breath become harder and harder. There’s no one in backyard. Like usual. Sometimes Ji Hyo wondered if the sound of laugh come from the backyard, a couple just telling old jokes but they look happy, a little girl come then run to them while sang the chorus of “Barney and Friends”, the flowers bloom so beautifully, and the sky looks bright. In first sight, all people will state that the backyard owned by lovely family. But the imagination are never happen. The backyard too gross and disgusting for being a romantic scenes’ background. There won’t be a couple… even a cute little girl… even love… spread in this death place. And she gasped when someone scream from the house. It’s him. JI Hyo almost faint due shock. The scream coming again. Rang out over the backyard and echoed back from the house. Ji Hyo poked her head out through the door that split backyard and kitchen. Song Ji Hyo did love Cho Kyuhyun. He is the most powerful and charming man she have met. Every girl were admire him, idolize him, lust to make him as theirs. They even dare to died for volunteering to do one night stand with him. And Cho Kyuhyun, one hundred percent known his popularity, become so arrogant. His chest swelled with pride and his killer smile are shown off. He has ultimate power to choose the girl he likes, or more likely, the girl he wanted be his contemptible slave. And Ji Hyo was choosen. At first, Ji Hyo was happy and proud that the charming one already fall for ugly duckling like her. She packed her things up, blabber so much about her happily-ever-after-love-story-with-Cho-Kyuhyun to all her friends, and even thank to Jesus everynight for making sweet miracle like this. She lived with Cho Kyuhyun. In his big castle—actually it is just a modern house in Gangnam but the size as big as castle. But then, slowly happiness turn become bitter sadness. The daydream she had are gone, and the pain knocked her right in her feelings. She hurt badly. Cho Kyuhyun is mean man. Too arrogant. Always thinks he is right and don’t care about other people. For Kyu, all Ji Hyo do always wrong and disgusting. Kyuhyun is harsh man. He even slapped Ji Hyo for nonsense, like when he just tired or when he found Ji Hyo forget to turn on the heater. He dare to make Ji Hyo crying everynight. His hand can be swing so easily to punch on Ji Hyo face. “It’s hurt, Kyu… it’s hurt…” Ji Hyo tried to stop Kyuhyun to punch her again. Her skinny body are broken like porcelain that fall from the hill. Ji Hyo shook her head. 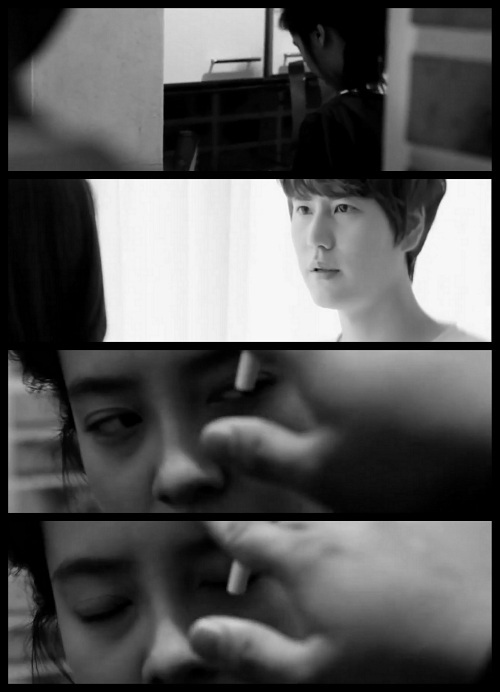 “I-I…” Ji Hyo looking into Kyuhyun eyes. The amazing hazelnut eyes that once makes her crazy. Ji Hyo admire the eyes. Like she admire the owner of the eyes… long time ago. Yeah, long time ago…, Ji Hyo doesn’t sure when she begin to think that the eyes is frightening instead of amazing. Now, Ji Hyo so scare and hate that eyes. “…no, I’m not hurt,” answer Ji Hyo. Ji Hyo try to smile back. And also try to hide her swollen face. “Wanna get kiss?” Kyuhyun asked. In past, Ji Hyo tended to say yes. 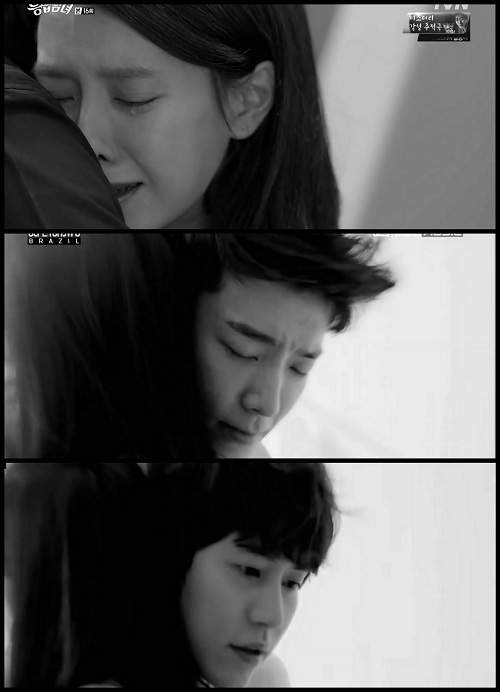 But now, when Kyuhyun kisses her so lust, she just crying deeply in heart. But, it didn’t happen again, when he came to this house. The melody he brought, mesmerizing Ji Hyo’s ears, lingers her heart with trembling. The harmony he played seduces her in the path of redemption. He. He is Lee Dong Hae. The one who came to the house with his good, kind, and gentle thing. Whenever Ji Hyo sees Dong Hae, that man always threw a sweet smile and soft voice, asking her condition or the weather of day—anything that can make conversation between them. “Really?” Ji Hyo tried looking her reflection in mirror. And yeah, she looks so white. Dong Hae do love music. He so crazy about that. Dong Hae have special room just for kept his vinyl records. He usually play the vinyl when night come. Music started slowly and vague, yet lured everyone to make a move. Moon and stars watching his gentle gesture through the window. And Ji Hyo too, through the hole in kitchen door. Watching how well Dong Hae dances when music was playing is likely fun thing for her. One cloudly morning, Dong Hae wakes Ji Hyo up. Ji Hyo was sick the day before, she collapsed in the street when just walking back from minimarket. The pottery of sunflower that she bought were wrecked into a pieces. Dong Hae are anxious. As Ji Hyo open her eyes, Dong Hae hugged Ji Hyo tightly. Ji Hyo find herself comfort in Dong Hae’s embrace. Her tears are flowing and her dry lips draw a smile line. Time to time, Ji Hyo’s soul seems to reincarnated, born again to be new Song Ji Hyo. 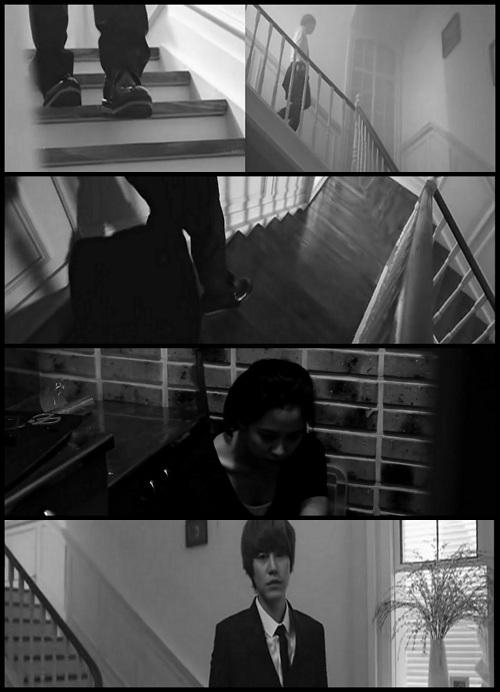 She hardly to believe that in Cho’s house, she could find a happiness. Her pain and injury are fading away. It’s look like finally she meet the real prince charming. Ji Hyo startled when Kyuhyun open the kitchen door. Cigarette smoke mixed with alcohol smelled from his lips. Ji Hyo just cooking for dinner but it seems her activity will disturbed by Kyuhyun. Kyuhyun smoked again. The amazing hazelnut eyes of him seems red. Like a beast who will jump to kick Ji Hyo in no time. The situation were not good. Ji Hyo knows it. She afraid that Kyuhyun may know that he just right. That Ji Hyo just falling in love again, with another man. And Dong Hae… oh no, Ji Hyo couldn’t even wondering what will happen to him once Kyuhyun aware the fact. Ji Hyo bite her lips. At that time, she heard the music come from the vinyl. Dong Hae was playing it, in the special room. Unknowingly, Ji Hyo closed her eyes and smile little bit. The music remind her to the moves, smile, even soft voice Dong Hae had. Kyuhyun off his hand. Looking careful at the pure face in front of him. All of sudden, he knows something bad really happen. This girl may really have an affair with a man. Then all Ji Hyo heard just footstep in the stairway. Ji Hyo didnt’t care about her swollen cheek, the boiling Kyuhyun made her in panic state. She knows Kyuhyun well, the arrogant man who don’t like lost to someone else. And now Kyuhyun must be doing something to win over. No, No, No, No. Ji Hyo shook her head. Her gaze become dazed. Kyuhyun can not kill Dong Hae. No, No, No, No. Ji Hyo love Dong Hae and no one can touch him! JI Hyo walked around kitchen. She bite her lips, ruffled her hair, whined anxiously. She must doing something, she must. She saw a knife lying on shelf. Her blank face stared that knife. The knife was supposed to slice the ingredents for dinner tonight. Yet, like there was something mysterious thing, forced her hand to grab the knife and ran over the house. In short time she just find herself step down the stairway without slippers. Catch up Kyuhyun hurriedly. That night was dark and extremely quite. There weren’t stars even moon in the sky. And even rain didn’t agree for dancing in the ground. 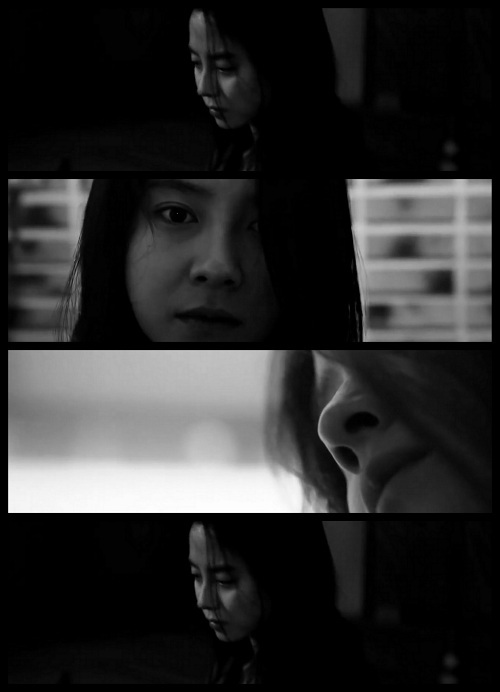 Ji Hyo hide herself behind the wall out of house, her hands in pocked, and stared the street blankly. Then she spotted Kyuhyun, wear a black suit and look so boiling. Ji Hyo come out from her cave and block Kyuhyun. He almost fall because her sudden appearance. 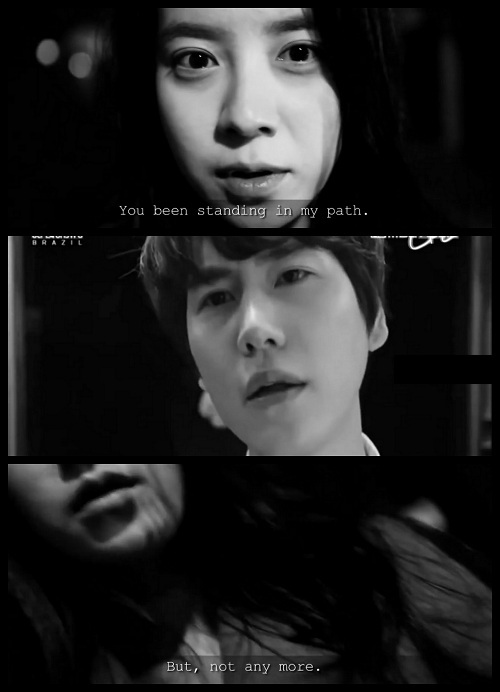 “You been standing in my path so much…” Ji Hyo come closer to Kyuhyun so she could whispered as devilish without letting anyone hearing everything. So only Kyuhyun that aware her dark side. The blind obsession towards new love she had found. Ji Hyo smirked at the time she stabbed Kyuhyun. “But no anymore..,” she whispered again. Kyuhyun blinked. His face look shocked. His body suddenly paralyzed. His breathe all of out. Bloody all over the place when Kyuhyun collapsed. Ji Hyo pulled out the knife from the corpse. Kyuhyun died. His almighty, his wild handsome face, his awesome hazelnut eyes are no longer in the world. Ji Hyo walking back to the house, wondering if from now on there’s only her and Lee Dong Hae. They will playing vinyl record every night, they will dance happily, even make backyard become sunny place. They can love each other like happily-ever-after-fairytale. Ji Hyo pushed the door and called Lee Dong Hae. The house so peaceful, to peaceful to be habited. She stepped carefully and gazed the emptiness of special room. The vinyl lying neatly on the table. No music. No melody. No dance. No Dong Hae. Covering her mouth with two hands. She thought it’d better if one is not present. She thought it’d be better if Kyuhyun died. She thought it’d be better let Dong Hae lived. But all she thought just a big wrong. Ji Hyo remember something terrific memories that always missed from her head. 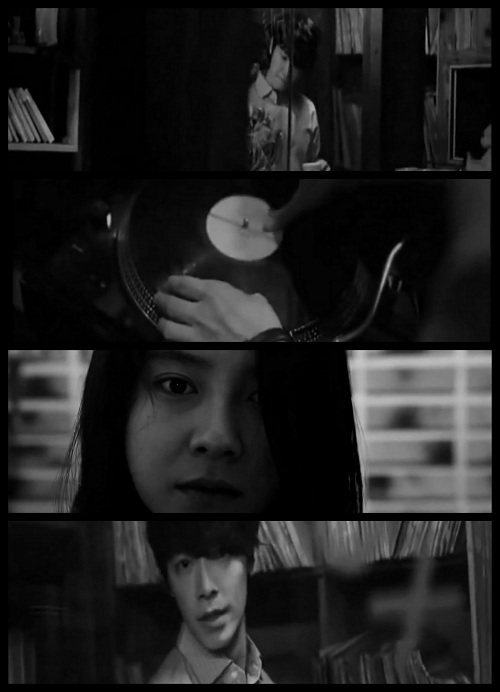 “What is it, Kyuhyun-ah?” Ji Hyo hold Kyuhyun’s hand when they come in to the classic room that full of vynil record. Yellow lamp was hang on the wall, create romantic atmosphere. Ji Hyo eyes are tearing as long as the memory do punch her brain. “How was your day, Ji Hyo?” Kyuhyun asked. “Really?” Ji Hyo tried looking her reflection in mirror. Kyuhyun smiled gentlely and took down the vinyl record. He did an awkward moves but that so funny until Ji Hyo laugh so hard. Ji Hyo approached Kyuhyun and dance along with him. “I love it,” said her. “I know…” Kyuhyun hugged Ji Hyo lovingly. The tune is not hovering anymore. Ji Hyo close her eyes and gasp out. The memories are clear now and it give an attack for her. The bad Kyuhyun did made her hating him, the bad Kyuhyun erased her loving care for him, the bad side of Kyuhyun forced Ji Hyo create one imaginary figure who have every good side of the Cho Kyuhyun. Its turn… Cho Kyuhyun and Lee Dong Hae… was the same person. jangan kaget karena ini bahasa inggris semua. wow, amazing fanfic. . .
waaaa eon pas liat ff ini bahasa inggris semua aku males banget bacanya kkk, lebih tepatnya males buat nerjemahinnya tp ujung”nya aku baca juga abisnya penasaran sih sama ceritanya, jarang” kayaknya jihyo dipasangin ama si evil maknae, ya kan eon? hmmmm jadi disini jihyo mencintai 2 orang? eh bukan, tp mencintai 1 orang dgn 2 kepribadian? berarti yg 1 nyata *lirik kyuhyun* yg 1 nggak? *lirik donghae* , berarti donghae itu cuma imajinasinya jihyo karna sifat buruknya kyuhyun? dan karna jihyo ngebunuh kyuhyun dia kehilangan keduanya? aaaah kasian banget jihyonya..
pasti ini inspirasinya dari vcr ss5 ya eon? kalo nggak salah, soalnya kebanyakan liat vcr ss kkkk..
Hhmm.. btw, are you watch ‘Kill Me Heal Me’? Cause I find a similar case about multiple personality -in this ff just 2 personality-. The idea, as always, cool!! This is from SS5’s VCR right? So yeaah.. the VCR always good (and somehow, better than the MV). Hmm… next ff.. hopefully wil be Hyuk (again). Hummm…ga salah nih. Biasa na kyu kan tukang resek sama mia..
wuiihh..ujung2nya jihyo ngabisin nyawa pacarnya sndr,tekanan batin bikin jihyo udh ga tahan lg sm kyu,pacarnya yg slalu nyiksa dia cm gr2 jihyo dkt sm donghae?? Wah Ji Hyo, are you sick? #apaan_ini ? #plak :v . Wah Kyu Hyun kok gitu sih. Dari sikap Kyu Hyun ke Ji Hyo kok kayaknya Kyu Hyun kena gangguan mental gitu ya? Kok perubahannya beda banget. Dari awalnya baik banget hingga ke jahat banget. ? Kasihan Ji Hyo jadi buat karakter baru untuk menggantikan kepribadian Kyu Hyun yang baik. Kan jadinya, Kyu Hyun selalu jahat buat Ji Hyo. Dan eonni, kau berhasil menistakan Kyu Hyun oppa-ku ini. #plak 😀 Selanjutnya… fighting eonni! Pas lihat ff ini udah girang banget ada ff baru dari mbak sophie tapi begitu buka dan lihat kalo isinya b.inggris langsung bilang ke diri sendiri “gak bakal baca gak bakal, males cape bahasa Inggris”. Tapi sialnya aku tak kuasa menahan penasaran dan kerinduan akan karya barumu. Thanks for making Kyuhyun as the main character. I think he has double personality. Bad and good. He is bad in no time and good the other like when Jihyo is sick. I couldnt imagine how desperate jihyo with the change of kyu’s personality so that she had an imagination that the sweet kyu was another person.